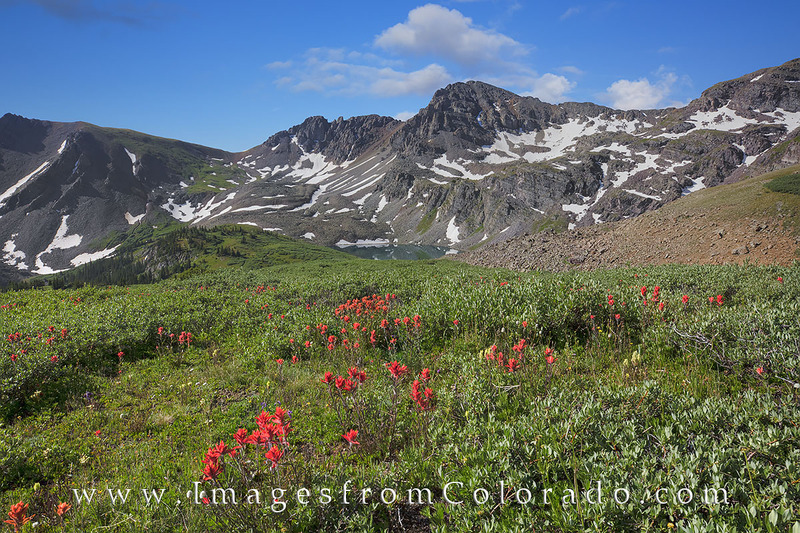 On the downslope from Electric Pass (13,500'), these Colorado wildflowers bloomed just above Cathedral Lake in the Maroon Bells Wilderness area. Located in the Elk Mountain range, Electric Pass climbs to a small notch in the towering rocks above and provides amazing views of some of Colorado's most beautiful peaks, including North Maroon and South Maroon Peak - both 14,000' summits. While most folks don't push onto Electric Pass, Cathedral Lake (seen here) offers a great destination to take in a high mountain lake with an impressive backdrop of rock and snow. Photo © copyright by Rob Greebon.